This is what a Monday morning looks like in our crazy house. Notice the smiles? Yeah, they were happy to smile it up for the camera and stall a little more this morning, making us a teensy bit late that didn’t even count against us. It was one of those mornings here, a morning where we just couldn’t pull it all together in time no matter how much nagging I did. One of the big changes we’ve implemented this school year, in addition to packed lunches, is a sit-down breakfast. It’s not a sitcom breakfast, where we’re all sitting down together, slowly beginning our day; truth be told, our mornings are usually like that scene in Home Alone where the family realizes they woke up late* and runs around the house in fast forward. Darin and I don’t usually sit down and eat breakfast at home, honestly, but the children have done it this year and not only is it a better start for them, but it’s much nicer on my car too in that there are no crumbs, no Pop-Tart wrappers, no crushed bits of cereal in my back seat. Every single morning Jaiden asks what we’re having for breakfast and it’s really nice to have an answer for her instead of telling her to grab something out of freezer or pantry and having her microwave, toast or bag whatever it is she ends up with (and that goes for the others too). It’s nice not to send Darin out the door with waffles for Emma every single day. It’s just nice to do it and they really seem to like it, too. What I’m really telling you? Is that this school year I’ve decided to torture myself by making three meals a day for five or six people (we only have Emma half of each week, plus every other weekend). It’s exhausting. But it really helps to have a plan. I’ve been meal planning for several years and it is wonderful for its organizational and financial benefits. 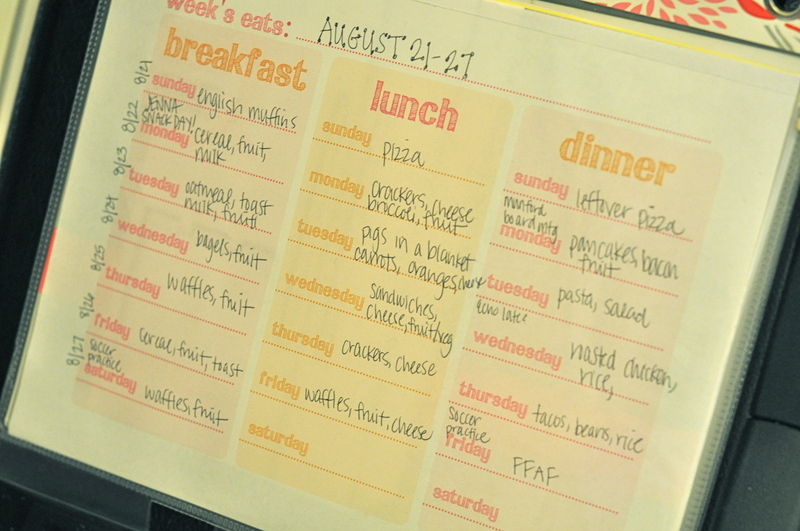 A few months ago I bought a magnetic tabbed organizer from Target and I love it; I use it every single day between our menu, the schools’ lunch menus and Darin and the kids’ sports schedules. Our menu usually goes in front and now that more than half the house can read, they know what we’re having for every single meal. And let me clarify: Just because it says we’re having pancakes for dinner doesn’t mean it will happen. I didn’t feel like fooling with pancakes tonight, so we had pasta instead and maybe pancakes tomorrow. We’re also switching our Tuesday and Thursday breakfasts so we can eat waffles for breakfast before Emma goes back to her mom’s house (waffles are one of her faves). As you can imagine, mornings are usually hectic around here. In the mornings I’m up and making lunches (if I didn’t get it done the night before) or breakfasts or taking a shower. I wake the kids up at 6:30 a.m. and we’re usually coming downstairs by 6:40-6:45 a.m.; this is when Daddy gets up. If Emma is here, she goes into the bathroom to brush her hair and teeth first, once she is dressed, so that she will be ready to go; when she is done she sits down, has breakfast and Darin rushes her out the door by 7:05 a.m. The other three kids ride with me (they go to a different school than Emma does, in a different part of our area), so they get a little more time to eat in the mornings. While they eat I do my hair, take pictures of their lunches, try on a million things before deciding on something I don’t really want to wear, listen to the Today Show, tell them to leave the cats alone fortheloveofallthingsholy, nag them to stop talking and eat, nag them to pick their belongings up off of the floors and to clean up after themselves, nag them to remember their lunch boxes and milk money. I try to leave the house by 7:40 a.m. Some days, like today, I am writing checks for school or trying to get a knot out of someone’s shoelace or refereeing a disagreement on the way to school (all while I talk to my friend on the phone); other days it’s a quiet 15-minute trip through the country and into town for school. At 8 a.m., when I drop them off, I sigh. My mornings are all about five other people and two kittens from 5:30-8. And the rest of my commute is all about me, all about quiet. All four minutes of it. And that’s how we do mornings. Meal planning template from here.